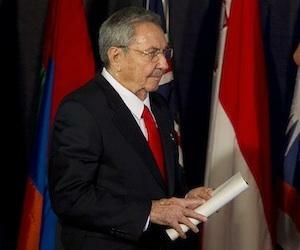 Cuba´s President Raul Castro, denounced today here that the global temperature rise will compromise first, integrity and physical existence of many countries and island nations, and will produce serious consequences to the Third World. "Despite the milestone that marked the United Nations Convention on Climate Change, emissions of carbon dioxide increased by 38 percent between 1990 and 2009", said Raul Castro speaking at the plenary session of the Summit United Nations Conference on Sustainable Development, Rio +20. Now we are going towards an increase in global temperatures that will risk, first, the integrity and physical existence of many island developing States and produce serious consequences in Africa, Asia and Latin America, said the president of Cuba. Raul Castro also said that thorough a deep and detailed study made during the past five years by Cuban scientific institutions essentially coincides with the reports of the Intergovernmental Panel on Climate Change and confirms that in this century, if current trends continue, there will be a gradual and significant elevation of sea level in the Cuban archipelago. This prediction includes the intensification of extreme meteorologycal events such as tropical cyclones and the increase of the ground water salinization, said Raul Castro. All this will have serious consequences, especially on our coasts, so we have initiated the adoption of appropriate measures, said Raul Castro. He indicated that this phenomenon would likewise have strong geographic,demographic and economic implications to the Caribbean islands, which also must face inequities of the international economic system that excludes the smallest and most vulnerable. (Prensa Latina).